Top 4 Agriculture Funding Programs for Ontario | Mentor Works Ltd. Generating over $630 billion in GDP, $14.8 billion in exports, and employing over 807,000 workers, Ontario’s agriculture and agri-food industry is a critical economic driver. These significant economic contributions are a main reason why the federal and provincial governments invest in agricultural producers and processors. Agriculture loans and grants can help companies leverage market opportunities and grow at an accelerated pace. Several agriculture and agri-food funding programs are available for Ontario companies to offset the costs of facilities, equipment, or business planning projects. Because of the wide range of government funding programs that agriculture and agri-food businesses can apply for, it can be confusing to understand which one is best for your upcoming projects. Fortunately, this guide explores the top funding programs exclusively available to food and beverage producers/processors. AgriMarketing is a stream of the federal government’s Canadian Agricultural Partnership (CAP) agriculture and agri-food sector funding framework. AgriMarketing helps businesses develop and expand into new international markets. It provides support to SMEs by allowing them to identify market priorities and increase their chance of global success. How much AgriMarketing funding can businesses access? AgriMarketing provides Canadian agriculture and agri-food businesses with up to 50% of eligible project costs to a maximum $50,000 per year. Over the five-year lifetime of AgriMarketing, businesses are eligible to receive up to $250,000 in export expansion grants. What projects are well-suited for AgriMarketing grants? The central focus of the AgriMarketing Program is to offset the costs of participating in foreign trade shows and government-led trade missions. These projects generally have several associated costs that can be covered through Canadian government funding, including branding and advertising (either print or electronic), product demonstrations, and economy airfare/lodging. What are AgriMarketing’s eligibility factors? Earn under $50 million in annual revenue. What are AgriMarketing’s funding timelines? AgriMarketing accepts applications on a continuous basis. This means that applicants should align their application submission around their upcoming trade shows and export events. Applications are typically reviewed within 75 days of submission; once approved, companies can begin incurring AgriMarketing-eligible expenses. AgriInnovate is another stream of funding provided through the federal government’s Canadian Agricultural Partnership (CAP). It’s specifically designed to help companies adopt and/or commercialize innovative agri-based products, technologies, processes, or services. Like AgriMarketing, the 5-year program is active until March 31, 2023. How much AgriInnovate funding can businesses access? The AgriInnovate Program offers repayable funding of up to 50% of eligible project costs to a maximum $10 million. Funding is offered through an unsecured 0% interest loan. Companies do not accrue interest on the funding but must repay the contribution after the project is complete. Contributions can be repaid over a period of up to 10 years. What projects are well-suited for AgriInnovate grants? What are AgriInnovate’s eligibility factors? For-profit firms operating in Canada’s agriculture, agri-food and beverage sectors are a great fit for AgriInnovate. The program is less concerned with applicant eligibility and instead focuses on the project’s level of innovation, how technology will innovate the sector, and if the company can afford to repay the funding contribution within a 10-year timeframe. What are AgriInnovate’s funding timelines? AgriInnovate offers a continuous call for applications. Agricultural businesses may apply throughout the year by submitting a pre-screening eligibility assessment. Applicants meeting the basic eligibility criteria are invited to submit a full application that is used to determine if a project will be funded. Applicants should submit their eligibility assessment no sooner than four months prior to their project’s start date to ensure relevant expenses are deemed eligible. The Canadian Agricultural Partnership (CAP) Ontario Processors program is devoted to supporting businesses that modify or manufacture agricultural products. Food and beverage processors may offset a portion of eligible project costs that directly support competitiveness and offer new growth opportunities. How much CAP Ontario funding can processors access? Through the Canadian Agricultural Partnership: Ontario Processors program, companies may receive up to 25% to 50% of project expenses to a maximum $20,000 to $250,000 in grant funding per project. The exact amount that can be awarded is highly related to the type of project completed. Some activities can receive a higher funding contribution than others. What projects are well-suited for CAP Ontario processor grants? What are CAP Ontario’s eligibility factors for processors? Have vendor quotes to support project costs. What are CAP Ontario’s funding timelines for processors? To access the CAP Ontario: Processors program, businesses must submit a comprehensive application during a call for proposals. Application review takes approximately three months from intake deadline. If approved, projects may begin incurring funding-eligible expenses. The Canadian Agricultural Partnership (CAP) Ontario Producers program is devoted to supporting businesses that grow, raise, or otherwise produce agricultural products. Agricultural producers may offset a portion of eligible project costs that directly support competitiveness and offer new growth opportunities. How much CAP Ontario funding can producers access? Successful applicants may receive up to 30% to 50% of project expenses to a maximum $2,500 to $75,000 in grant funding per project. The exact amount that can be awarded is highly related to the type of project completed. Some activities can receive a higher funding contribution than others. What projects are well-suited for CAP Ontario producer grants? What are CAP Ontario’s eligibility factors for producers? Have a valid Farm Business Registration Number (FBRN), unless exempted. What are CAP Ontario’s funding timelines for producers? To access the CAP Ontario: Producers program, businesses must submit a comprehensive application during a call for proposals. Application review takes approximately three months from intake deadline. If approved, projects may begin incurring funding-eligible expenses. Businesses from across Canada, including those located in Ontario, are constantly awarded government funding to support strategic growth projects. Explore these recent news articles to learn more about agriculture funding programs and the companies they have awarded. Ontario agri-businesses can tap into a substantial network of organizations to support their growth. 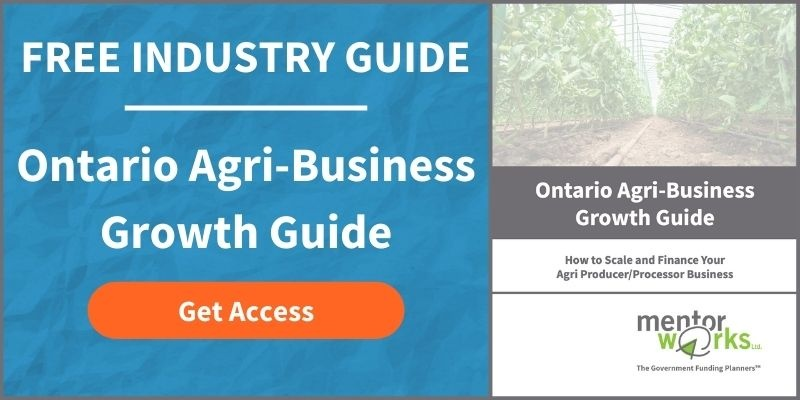 Discover how to manage, grow, and finance your operations from the industry’s leading resources by downloading the Ontario Agri-Business Growth Guide. Posted: January 17, 2014. Updated: November 13, 2018. Looking to obtain a $200,000 grant or low interest loan for a capital project. Is there any possibilities of obtaining such for an indoor riding arena? Thank you for stopping by our blog. I don’t believe your project would qualify for funding for agriculture and agri-food. I would start by visiting your local RIC. This may be an old post, curious if there are more current updates for the same purposes? I’m looking at getting into mushroom cultivation and looking to get and for start up. This year there have been many updates to agriculture & agri-food funding programs. With the launch of the Canadian Agricultural Partnership, there are many new and expanded government funding programs provided to established businesses. Unfortunately, there are not as many opportunities for startups and pre-incorporated businesses. For more information on early-stage business funding, please visit our Startup Resources page. Looking for a grant to build a barn for our existing veal meat business. We are currently renting our brother in laws barn and are looking for a grant to build our own barn. This is are second year in business. Is there anything out there for that? Hi Brandi, thanks for your question. Our internal agri-food industry expert says there are no government grants available to build barns. Your best resource for obtaining capital for this project is Farm Credit Canada (FCC). just wondering if there are any funding opportunities with real estate purchase to start a farm? Government grants and incentives do not typically cover real estate costs, such as the costs of purchasing a farm. Your best resource for obtaining capital for this project is Farm Credit Canada (FCC). I have a project is an aquaponic farm but I don’t know if the grant program help in this kind of projects, I have some knolege but I have to start and I don’t have capital because I am inmigrant. it is possible? Hello Rafael. Unfortunately, there are not many worthwhile grants for startups and pre-incorporated businesses. However, Farm Credit Canada (FCC) could potentially provide capital for this project. I am planning to purchase and modernize old, out of business fish farm with capacity of hiring minimum 50 full time employees gradually in two years. The project needs about 2 million dollars for purchasing and modernization and another $500,000 for the fish stock. The production capacity will be estimated for about 350k to 500k in sales. in 2 years time. Expected wholesale and retail domestic and USA Customers . I have experience with fish business for almost 30 years. Can I expect some grants and no interest loans on provincial and federal level, and if yes how much and for each separate business activity. Hi Ryan, there are government funding programs that could potentially support your project. However, we need to know more about your expenses and timelines before recommending some good fits. Please use our Contact Form to speak with a Government Funding Planner; they have the resources to support your funding discovery and application. We are a cow/calf operation. We currently run 40 cow/calf pairs on an average year. We have a mid 70’s 1 storey tie stall barn, 32′ x 170′. We would like to either raise the roof or demo and build new with higher ceilings. The reason we are doing this is so we can contain our manure under cover until we apply it to the fields and so that we can have easier access to handle the cattle during calving and for other handling purposes. We are looking for grants/loans that might bee available for this project. Hi Keenan – Thank you for the background on your project. A Mentor Works team member will be in touch shortly to explore eligibility for funding with you. Hi Peter, a project of this scale will likely qualify for government funding, but we’ll need to discuss you project in greater detail to make a recommendation. I’ve asked my colleague Katlynd to reach out to you so that you can talk about the project; please expect her email within the next 1-2 business days. We are a chocolate maker operating in Toronto, but with our roots in niagara region. We make chocolate from raw cacao, and are looking to expand into a new production facility to increase efficiency and output. Do you know of fitting grants that could assist in either acquiring the equipment line as well as anything for moving our operation to the area? We’re currently in the process of looking for land on the wine route to build, so we are a ways out, but feel planning is key! Hi Kyle, thanks for your message! It seems like there is great potential for funding here; there are a few government incentives that could support your expansion and capital investments but we’ll first need to know more about your project budget and timeline for spends. I’ve reached out to one of my colleagues who will be in touch with you later today. We look forward to helping you uncover and access funding opportunities! We have been operating a beekeeping business in Ontario since 1954 ,in the same building for that whole time . The town has slowly grown around us and we are now in the middle of the town. As of lately we have been receiving grate pressures from the municipality with the storage trailers we have on site (4) . The municipality is forcing us to get rid of the trailers and replace with an addition to the honey storage and processing portion of the building. Do to bio security, ease of operations, costs,and multiple other reasons we would like to have all our storage and processing on site as we have for the past 65 years but with out building this additional space we can not operat as we have for the past 65 years . Are there any possible grants that may assist us in remaining were we are and building addition ? Any help would be very much appreciated , thank you in advance. Hi Peter, thanks for your question. This is an interesting growth opportunity for your business, and there may be funding programs to help support your facility expansion. The first program that comes to mind is the Southwestern/Eastern Ontario Development Fund, which is typically what we’d recommend our clients to explore. However, although the fund supports facility expansion and technology adoption, it requires the funding recipient to hire 10+ employees by the end of the project. Alternately, there could be support available through the Canadian Agricultural Partnership (CAP) Producer or Processor program, although we’re currently waiting for a new cycle of funding to be released before we fully understand what types of projects are being considered for funding. I’d like you to connect with one of my colleagues who can talk to you about your expansion and learn the scope of your project. That’ll make it easier for us to tailor results towards your budget, timelines, and expected results. Please allow for 1-2 business days and we’ll be in contact by email. Thanks!